Game-Day Jitters by Rich Wallace. Kickers. 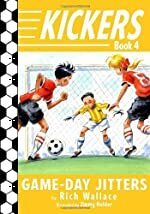 Review: Game-Day Jitters is an amazing book, written by Rick Wallace and is part of the Kickers series. Ben is the main character, who has some pre-game soccer jitters. This book is amazing because of the way Rick Wallace makes the story progress. Any sports fan, especially a soccer lover, would love Game-Day Jitters. Nervousness and excitement describe Game-Day Jitters by Rick Wallace. Ben is a 10 year old soccer player who has a big semi-championship and then an even bigger championship if they win that one. Focus, pass, and play like a team is what Ben always tells his team, but Ben doesn't follow his own advice when they are playing in the championship. Ben also gets to competitive with sports and since he got so competitive he loses a friend that really understands his sports dilemma. His brother Larry is also big on sports like cross country and at his meet Ben learns the meaning of a true friendship. Is he to late though? Has he lost his best friend forever? To sum it all up the whole story is about a boy and his troubles with friends and soccer. Rick Wallace is a excellent writer. To demonstrate the relationships between the characters, he wrote, "He did look over a few times and I mimicked his favorite gesture, beating my chest and pointing." It's easy to get a sense for how characters feel. Anyone who loves sports would love this book, but especially soccer fans. Game-Day Jitters reminds me of when I play soccer and get competitive with someone on the other team. So go out play sports and read this book. We would like to thank Random House for providing a copy of Game-Day Jitters for this review. Have you read Game-Day Jitters? How would you rate it?